First publicized for its use on the Motorola DROID, Corning's Gorilla Glass has become a must have spec on high-end handsets as it protects the glass display from cracking and breaking. Corning puts the glass through a special salt bath which tempers the glass by sticking large ions into its surface, making it harder to break. 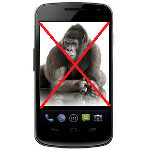 Considering that the Google GALAXY Nexus would be considered a high-end handset, it might be surprising that the device will not feature any of Corning's Gorilla Glass on the phone. This has been confirmed by a tweet sent by Corning which shoots down some rumors that have been spread around that the device would offer the protected glass on its screen. The rumors came from a flyer that incorrectly listed Gorilla Glass on the specs of the phone. Just because the Samsung GALAXY Nexus won't have the protection of Gorilla Glass doesn't mean that it will shatter instantly the moment it touches your hand. Still, we can imagine the hand-wringing that has started up already. And for those of you on the fence between this model and the Motorola DROID RAZR, the latter's 4.3 inch Super AMOLED screen is made from Gorilla Glass. No, actually it doesn't. That is the whole point of the curved display. I have dropped my Nexus S a million times and I have not one scratch on my display. I literally drop it for fun sometimes. The display doesn't get scratched when landing or on surfaces because it doesn't lay flat down and I have never had an instance where it got scratched by any other means. I have even thrown it face first on concrete cause someone pushed me in a pool and I was holding it with no case. boy you are going to be mad that one time it fails. Yeah that one time, but he'll be happy it didn't happen the 37 times before that. Kristo, you just helped me make my decision, thanks man. Going with the Nexus. The "whole point" of a curved display is purely ergonomics. Holding a rectangular slab to your face is nowhere near as comfortable as holding something concave such as this, the Nexus S or the HTC Hero. It's not for durability; in fact, it has a rather opposite effect. 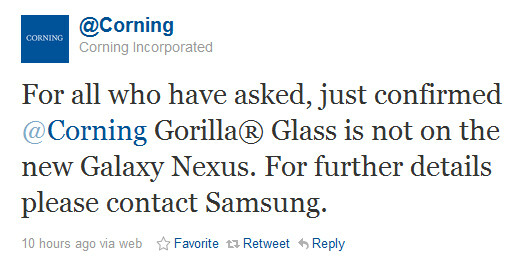 Either the Nexus S has Gorilla Glass, or you are just incredibly lucky. Basic physics dictates that hairline fractures and such are much more likely to happen on a display where the shock of a fall is not evenly distributed eg: a curved display. Of course, there is an easy solution: just don't drop it :) It only takes one drop and your $600 toy is destroyed. I can promise you I've dropped it at least over 400 times on every surface imaginable. Nothing lucky about those stats. I could have been a tester on dropping my phone cause I stopped caring that first time I dropped my phone, face first on concrete, and picked it up and smiled. Only the top and bottom, where there is a plastic outline, was scratched. Then I started throwing my phone around the house for amusement. I drop it while I'm out an extreme amount of times cause I honestly don't care. It hasn't harmed my phone at all. There are multiple reasons for having a curved display. Every reviewer mentions that ergonomic wise, the display isn't curved enough to really make a crazy amount of difference. I haven't found myself thinking of that aspect as a difference to any phone I've had previously although I think it looks cool. So in my opinion, its main use is preventing the display from getting scratched. It has worked flawlessly in this regard for me. I have had the phone since day one. it matters completely. I am clumsy. I have dropped my device.. run it into things while it was in my pocket, its been thrown, stepped on, and hit pretty much any surface u can think of.. and it doesnt have a scratch on that screen... why? because its gorilla glass. you see the drop test between that teeny tiny iphone 4s and that big SGS2? the 4s shatters all over the place while the SGS2 barely gets hurt. The SGS2 should be more breakable because of its size.. not less. Why isnt it? because of gorilla glass and samsungs build quality and use of PLASTICS over metals which absorb vibrations and dents better than aluminum casings. Gorrilla glass is a BIG deal to me. Thats right up there with processor and screen. I cant fathom that its made out of glass over gorilla glass with a 4.65 inch screen on that thing. That may just be the nail in the coffin for me for this phone. I can get over 1 thing.. the processor.. i dont know if i can compromise on 2 or more, not with so many phones coming out all the time. GET INSURANCE PEOPLE OR DONT GET THE PHONE. i will never buy insurance. to me it is a silly investment. i'd rather take my chances and be motivated to care for my device. if it does quit on me or get lost or stolen, i'll buy a used phone for around the same cost as my insurance premium and deductable. most definately not. If you bust your phone (an expencive one) in the first 6 months to a year, the insurance deductable is waaaaaay cheaper than anything you will find on craigslist or ebay. As the phone gets older, sure u can drop it and save a few bucks on craigslist, but in that first year you are a fool to have an expensive phone without insurance. A year's worth of premium payments + a deductible on the most expensive phone comes out to $216. Try finding an i4s, SGS2, or anything of that nature for so cheap in the first year from ebay or craigslist. We had a customer that bought the Hercules on launch day and broke it within the week. Where would he have found a better deal than his insurance deductible? That happens quite often. oh, i wouldnt be buying top of the line if i broke a brand new device. i have an X now and im happy with it. if i buy a galaxy nexus or razr and break it within a week, i'll buy another X, wait 6 months and buy something else used. i just really dislike the idea of paying for insurance up front. and those deductables are going to rise as new phone costs rise. Never thought it was any good anyway, and by that I mean the phone. Considering how you've used the phone extensively to have such a bold opinion on it, please humor me as to why it is "not any good". That hasn't stopped you from finding the time and a reason to post on every article about it. Must be better than you're willing to admit. Or you just have no life. I'm betting on both. Samsung should use Asahi Dragontail glass if not Gorilla glass. Without glass protection it will get scratch in the first day. You needed someone to put a glass protector immediately cost $30 after purchase which is very bad for high-end phone. The vast majority of cell phone users will put a screen protector anyways - so no, it doesn't matter. No offense, but isn't it the job of the elite devices, of which this is supposed to be one, to not need a protector to the best of it's ability? I mean, I am willing to bet it is going to be sold at really high end prices. So why not provide a high end product? This is a strike against it in my purchasing decision. screen protectors help against scratches. gorilla glass helps against scratches AND drops. That's a ...... curious decision on their part. Can't think of a solid reason why you wouldn't use gorilla glass. But uts still a fortitied glass right? So should it really matter? Man every damn blog now is going nuts over the fact the Nexus isn't using GG, but at the same time fail to mention that it is still using fortified glass regardless. Now, how it fares in real use that remains to be seen. Why jump the gun? unless it uses dragontail glass, any other fortified glass isn't nearly as durable.